What Makes a Strong Mental Game? 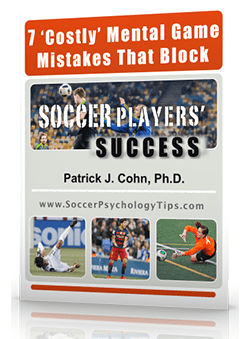 How would you rate your mental game during soccer games? Do you practice better than you play? Are you able to play at your peak at critical moments in a game? 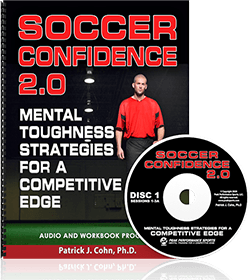 A strong mental game in soccer is the ability to play at peak levels despite all the ups and downs of a game or season. The most important part of your mental game is that it is a game within yourself. You can choose to be your toughest opponent or choose to build your game and achieve more of your potential. Building a strong mental game requires confidence in your abilities and resiliency to overcome challenges. Confidence entails building upon your strengths while seeking to improve weaker parts of your game to add to your overall development as a player. Resiliency is your ability to bounce back from adversity and to use that experience to grow as a player. Confidence and resiliency are the dynamic duo. If you are confident in your abilities, you will be able to persist in the face of challenges (becoming more resilient). The more resilient you are, the more stable your confidence will be in difficult situations. 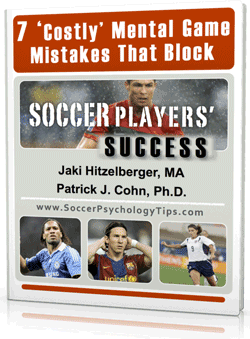 Suppose you are a starting defense man who just miss-played a ball allowing an opposing attacker to score. If you do not have a strong mental game, you may not be able to get that play out of your head and play timidly fearing another mistake. If you have a strong mental game, you will be able to learn from your mistake and bounce back regaining your competitive style of play. Clint Dempsey plays forward for the Seattle Sounders FC in the MLS and is also a captain on the US National team. This winter, Dempsey was on loan to Fulham FC on the English Premier League though he didn’t play his best soccer. Despite his shaky play for Fulham, Dempsey’s strong mental game remained intact. Dempsey responded to the dip in his performance with confidence and resilience scoring six goals and three assists in five appearances upon his return to the Sounders. Everyone make mistakes or has bad performances. The important thing is how you respond to a mistake or bad game. Or you can choose to focus on your mistakes and allow those mistakes to define you. Your mental game, ultimately, shapes your response.